This walk: 2012-4-11. 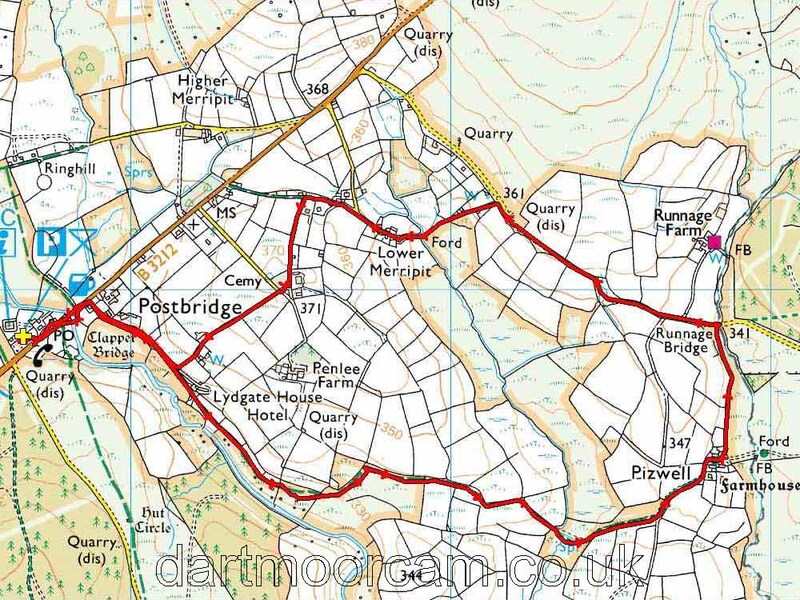 Postbridge, road bridge, clapper bridge, dipper, common polypody, gorse flower, East Dart Valley, old disc harrow, Dury Brook, Sousson's Wood, Pizwell, Runnage Bridge, Billy from Pizwell, young rabbit, Postbridge Cemetery. The narrow road bridge at Postbridge, built after the Turnpike Act of 1772. This is a relatively modern village but with evidence of prehistroic settlement. Also, there are nearby ancient tenements of Pizwell and Merripit. Nearby Lydgate was a house built in a day by Richard Hannaford. Its name was changed from Lead Gate in 1894 and the old house burned down in 1899. A treee loaded with a colony of Common Polypody, Polypodium vulgare. Out of focus gorse flower. Looking down the East Dart Valley towards Dartmeet. An old disc harrow to break up the ground after ploughing. "There may be water ahead ....."
Somewhere along here we crossed the Dury Brook (to Dury Farm). In the distance is Sousson's Wood that we were all so interested in, having walked there only on 4 January 2012! A gate of many parts. Entering the ancient tenement of Pizwell, which is beside the Wallabrook. THIS LINK should take you into Google Satellite Imagery of the area - embedding the maps is proving difficult on my system. Walking down between the buildings, said to be three old longhouses originally with their outhouses. Spot the dog, Scooby! A name plate. Pizwell = Peas Hill, where peas are grown? One of the Duchy's oldest farms. "Public bridlepath to Lydgate and Postbridge". Approaching Runnage Bridge that crosses over the Wallabrook. Another view, with a gatepost at the far end. The rabbit recovers in a hedge. Crossing the Dury Brook again at Lower Merripit. Another ancient tenement that may mean Pleasant Hollow. This is a Grade II Listed Devon Longhouse and is home to several artistic activities: Holiday stays, Seventh Wave Music CDs, Books and Prints, Instruments, Concerts & Events, etc. "Well, I'm not going down there!" A full scale round house ..... 6.7 metres in diameter, started in 2001, the walls are 1-metre thick, packed with rubble and mud ..... thatched with rye grass for a 10-15 life (just thinking about re-thatching, we were told)..
An image of the low wall that forms the round house. Another old chimney that once accommodated a thatched roof. Notice seen along the way about shooting dogs that worry sheep. Cemetery - 1. Plannned in 1903, completed 1906. Prior to 1260 the dead had to be carried to Lydford; after that they were buried at Widdecombe. Looking north up the East dart River. Another view of the clapper bridge at Postbridge. Pizwell Scooby waiting for a trunk call, or to be collected after his adventures of the day? Apparently, not for the first time. This walk was accessed from Plymouth with parking in the main car park across the road from the telephone symbol at the top of the map image. This park has toilets and the Dartmoor Information Centre. Distance - 6.32 km / 3.93 miles.